STOP PRESS! CHRISTMAS EARLYBIRD TICKETS NOW SOLD OUT! 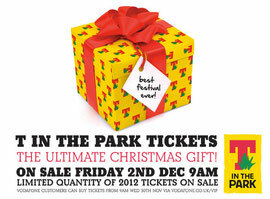 T in the Park recently announced The Stone Roses as the first headline act for T in the Park 2012 and now organisers DF Concerts and founding partner Tennent's Lager are giving fans further reason to celebrate by releasing a limited amount of 2012 festival tickets for sale at 9am on Friday 2nd December. Music lovers can grab their tickets on Friday and guarantee their place amongst the 85,000 per day strong crowd at T in the Park 2012. With The Stone Roses already announced and a stellar bill made up of some of the best live acts in the world set to follow, T in the Park 2012 will undoubtedly boast the festival bill of the summer.